Howdy! You can now add your free host and search our new database of free web hosting companies. If your host was listed in the old database, please add it again. We’re sorry about this. 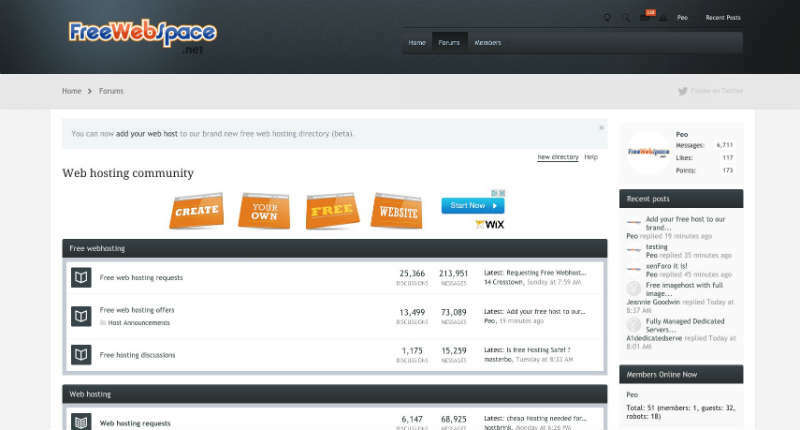 So, we’ve made some big changes to FreeWebspace.net over the last few weeks. Here’s what we’ve done and why. FreeWebspace.net has been around since 1996. The world of free web hosting has changed a lot since the days of Geocities, Portland, Fortunecity and Hypermart. Free hosting is not what it used to be and that’s both good (much better features now) and bad (social media reducing the need for a free host). 19 years later, free hosts are still available and users get much better features. It was time for us to make some changes. Last month we started the process of moving our forum away from the vBulletin software to xenForo. More than 125 000 members have joined our community. You can read more about this migration to xenForo here. And you can join us here! Over the last couple of days we’ve also started working on a new directory for the main site. This is where you can search for a free web host and add your own web host. It’s still in beta and we’re working on improving things every day. If you have any suggestions or questions, please let us know in the comments below or at the forum. We appreciate all feedback. Thank you!